Ralph Hollingworth was a man who didn’t like fuss. When something was over, it was over. It was how he was with the Second World War. Once the dust had settled, Ralph turned his attention to running the family business in Thurmaston and to raising his three daughters in Stoneygate. Even when it was time for the former spymaster to collect his award from the King of Denmark with co-receiver Winston Churchill, he told them to put it in the post. Not through arrogance, but a need to get on with his life. But if you ask his daughters, the war never really left the man who became the heavy-smoking boss of Helvetia Abrasives. Its spectre lurked in each tug on a cigarette. It was present in every hasty glance over his shoulder. If he was a haunted man, Ralph was also a hunted man – yet he escaped the SS in Nazi-controlled Denmark with an audacious Hitler salute as his British passport burned a hole in his pocket. And yet, as head of the Danish section of the Special Operations Executive, Ralph had expertly played a high stakes game of cat and mouse. It wasn’t just that a right or wrong move meant the difference between life and death. Ultimately, it meant the difference between a free Europe. 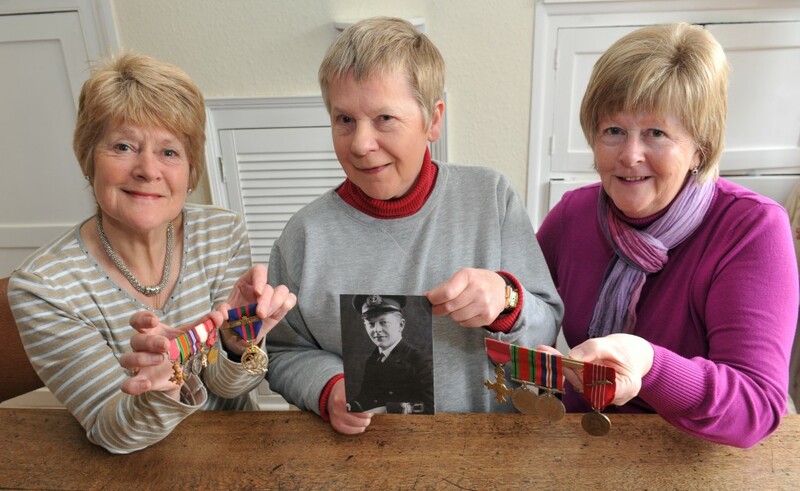 Today, Ralph’s war story is still a military secret. His SOE file – HS9-731 – remains under an 85 year gagging order at the National Archives in Kew. The seal comes off on January 1, 2031. 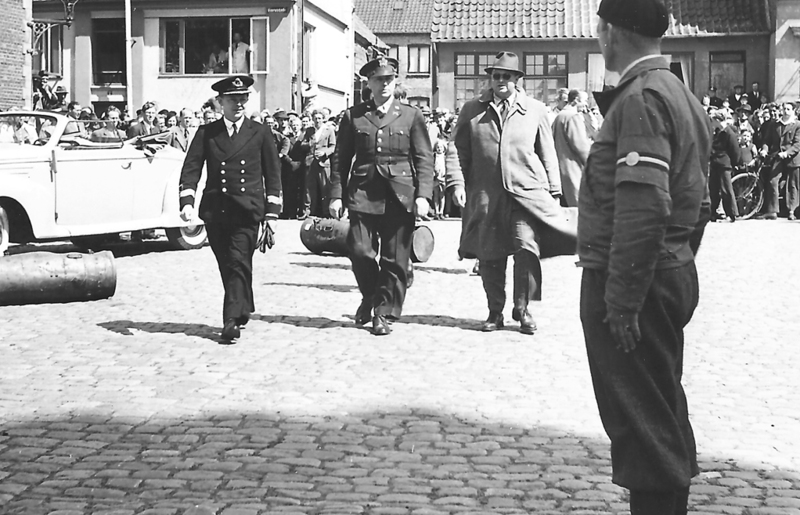 Ralph with Captain Kai Winkelhorn from the US Office of Strategic Services, with Danish minister Stig Jensen in Næstved, Denmark on May 10, 1945. 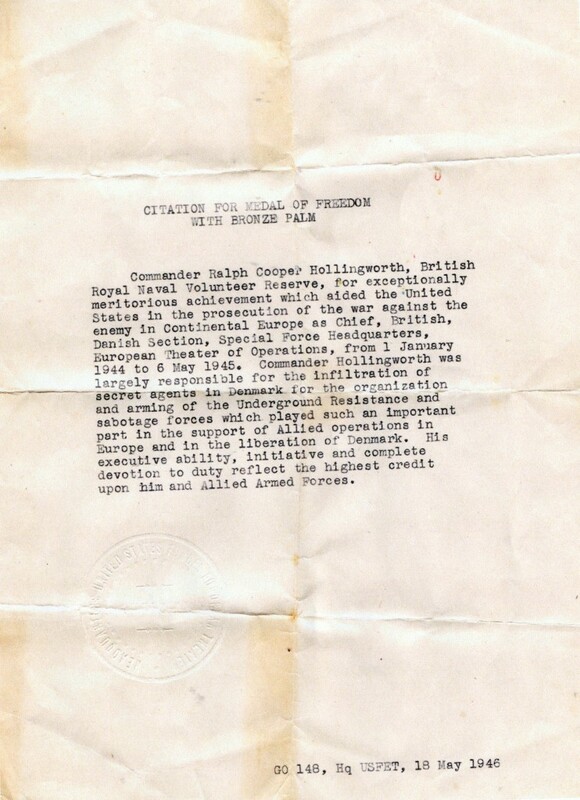 This official silence is compounded by the fact Commander Hollingworth was mostly quiet on his war activities. Which means his daughters – Ann, Judith and Gill, who all live in Leicestershire – apologise profusely for the lack of information. There’s the odd thing they remember being told; how “Far” helped write a few of Churchill’s speeches; how he hid in a toilet cubicle on a Danish train as German soldiers searched for spies and how he didn’t lock the door because he knew the German psychology was to kick that door in. 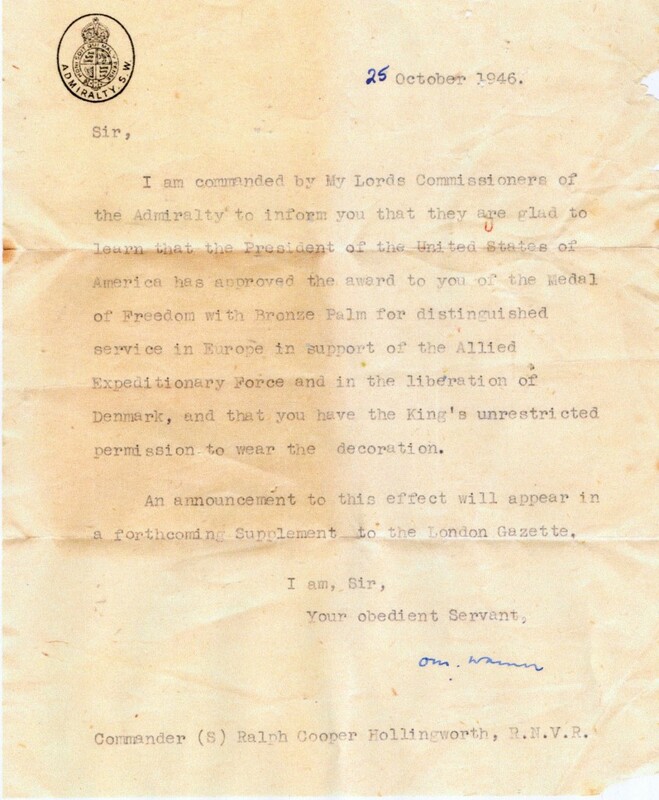 Then there’s a copy of the letter he drafted to the Admiralty about escaping from Denmark just days after the German invasion. There’s also the official, post-war plaudits: the Medal of Freedom with Bronze Palm from Harry Truman, the US president, the OBE from the Queen, the RNVR, and the Knight of the Order of the Dannebrog from the King of Denmark, which he ended up collecting from a Danish minister in London. At a cottage in Stoughton, among the sisters’ papers and items, is a solid chunk of railway line blown up by the Danish resistance – another of Ralph’s awards. It’s a tough one, this, for Gill and Ann, talking about their father. Voices betray the occasional creak of emotion, eyes cloud with tears, noses redden. Ralph died of a stroke aged only 59. The war had clung to him in the same way the smoke from Players cigarettes gripped to his clothes. “I used to go on at him about smoking in the last few years before he died,” recalls Gill, “and he would say ‘if you knew what I went through during the war you would realise why I smoke’. If there’s no smoke without fire, it was a blaze at Ralph’s father’s factory in Ireland that had originally led him to a pre-war Denmark. With the building uninsured, the hope of Ralph’s university education faded in those dying embers. So, after leaving Wyggeston Boys School at 18, he set off from the family home in Market Harborough and caught a ferry to mainland Europe. During his travels, he made his way through France, Germany and, eventually, Denmark. A remarkable thing emerges – Ralph’s hitherto unknown aptitude for language. Not only did he pick up French, German and Danish, he spoke each language fluently – without trace of an English accent. While in Denmark, he worked in a Copenhagen bicycle shop by day and taught English at evening school by night. The bike shop, which had a friendly Alsatian, later became a cover for agents working in the Danish capital. And even the Alsation was enlisted to send messages. “He never said much about being in France or Germany, he talked much more about Denmark,” says Gill. 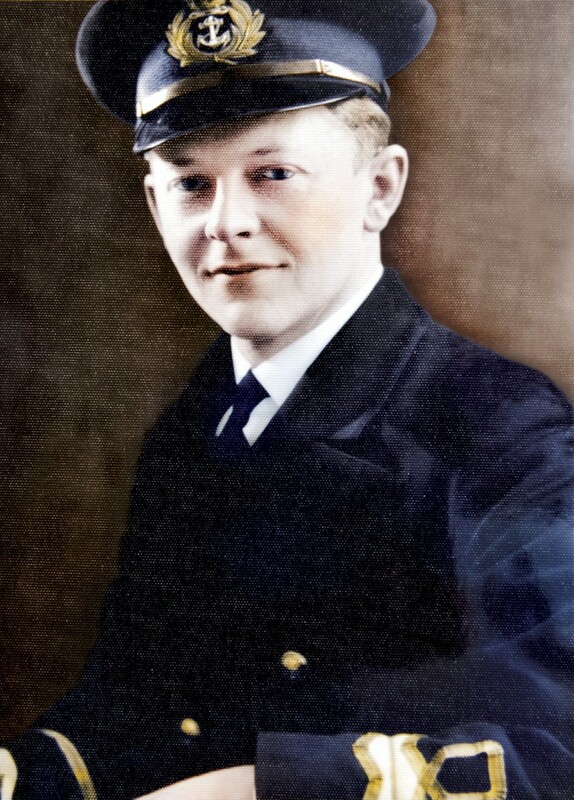 Ralph joined the RNVR (Royal Naval Volunteer Reserve) in 1931 and was based at the Naval Mission in Copenhagen when war broke out. In April 1940, just months after WW2 erupted with the German invasion of Poland, Ralph was sent by the RNVR to Iceland. There were plans to send his fiancee Fif (Freda) to join him. 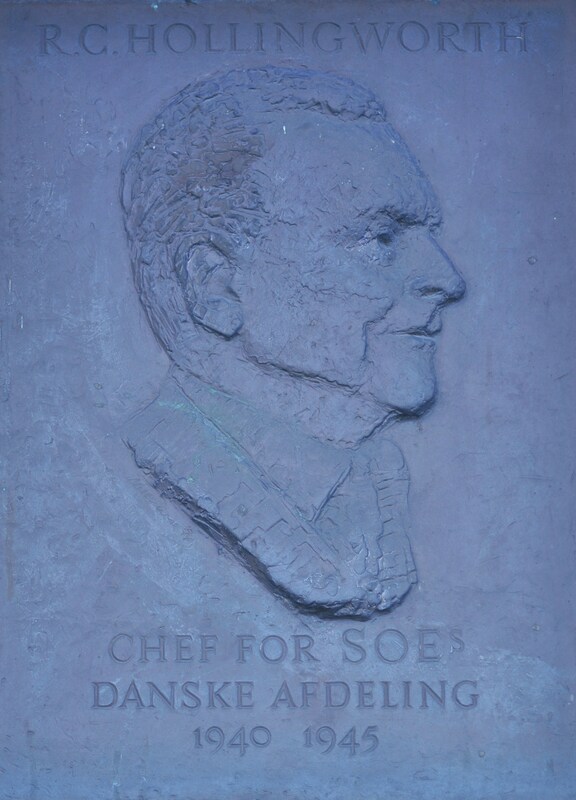 But then he was suddenly recalled to Denmark and appointed head of the Danish section of SOE. As Commander Hollingworth, his job was to recruit agents for training and deployment to Denmark and to oversee their collaboration with Danish Army Intelligence and the resistance. Ralph’s codename “Lillefar” – Little Father – was on account of his height and the care he extended to his operatives. 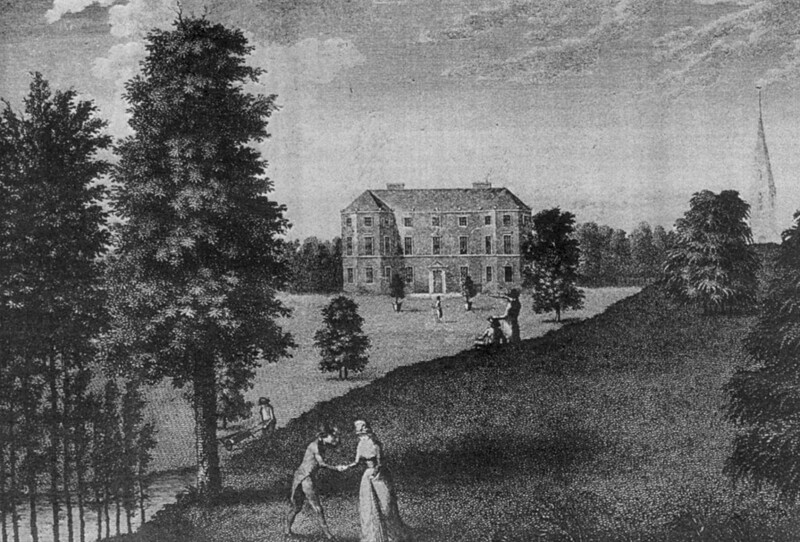 Many of them trained at Gumley Hall, just outside Ralph’s home town of Market Harborough. 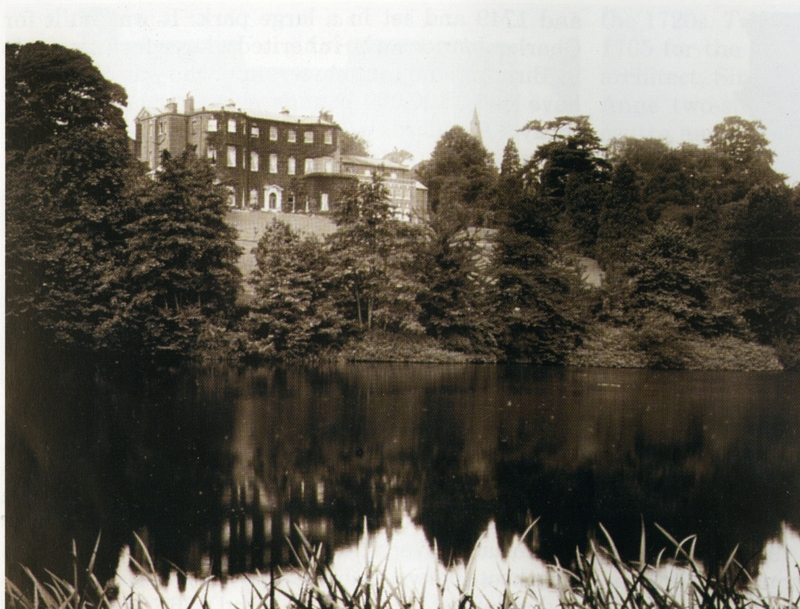 The first 15 recruits moved in to the stately home in January 1941. Gumley Hall near Market Harborough. Pictured before the war. Afterwards it was knocked down. In an interview with the Mercury in 1965, Ralph revealed a little about the art of SOE espionage. “It was all very trial and error at first,” he said. “But it was made easier because the Germans were a bit stupid. All that was needed was to do the last thing they expected.” On one occasion, he said, a wireless operator handed his case containing a set to a German guard and went to smoke in the next room. The case was never searched. Ralph had his own taste of playing secret agent in the spring of 1940. It was Sunday, April 7, and Denmark was two days away from occupation. Ralph made a short trip to Langeland, a small Danish island, to investigate sweeping operations in the German minefields at the entrance to the Danish straits, which are known as `belts’. The city of Odense was the nearest place to send coded telegrams, so he warned the Vice-Consul there to “be ready” should he unexpectedly return. We know all this because of a remarkably matter-of-fact letter sent by Ralph to the Admiralty from his parents’ home The Firs, in Market Harborough, on April 19, 1940. That letter explains how Ralph was on his way to Langeland when a German plane circled his ferry, creating a flagrant breach of neutrality. On reporting the incident to Danish state police he then “learned of considerable activity in the Langeland belt”. Ralph hurried to the island’s eastern side to discover 60 German ships had passed through into the Great Belt that day. It was then Ralph alerted Britain, and the world beyond, to Germany’s imminent invasion of Denmark. On learning the next morning that Denmark had been attacked, Ralph raced to the British Vice-Consulate, where he and staff “succeeded in burning all our secret documents”. Ralph then needed to return to his post in Copenhagen, and rang a friend, the assistant chief of police in Odense, to discover the extent of the Germans’ control. Ralph decided to risk catching the 11.35am train at Odense and then a ferry from Nyborg to Korsor the next afternoon. Ralph had to think fast. The pair were soon on good terms and by the time the German officers inspected their compartment they thought Ralph was a friendly native and overlooked him. Chatting volubly to his newly-acquired “friend”, Ralph walked past the guard and then bought his companion a beer in the ferry salon. Fearing his friend might seek other company during the two-and-a half hour journey, he enlisted his help with a Danish crossword. At Korsor, the station was awash with troops and officers scrutinising passengers disembarking from the ferry. For most of the war Ralph was based at intelligence HQ in London’s Baker Street. As a result, the Hollingworths moved house with unsettling regularity: there was always the fear Ralph was being followed. In December 1941, Ralph coordinated the first parachute drop into Denmark. It was to be marred by tragedy. Dr Bruhn’s parachute failed to open and he was killed. His young wife sensed something terrible had happened, but Ralph, bound by secrecy, was unable to tell her anything. Anne Bruhn was later godmother to Ralph and Fif’s first daughter in 1942 and also gave Ann her name. Gill followed in ’45 and Judith arrived in ’47. Ralph was a good father, although a tough task master, they recall. “He was extremely handy around the house,” she laughs. “We used to call him Maintenance Man. I used to go in his shed – he’d built two or three TVs. He’d got one done in time for the Coronation. “He referred to a lot of things as `a storm in a teacup’,” smiles Gill. “He didn’t do sport, he never touched the garden. He liked Wimbledon and crosswords. In peacetime, Ralph was MD of Helvetia Abrasives, a factory in Thurmaston which made emery boards. Beryl Whittaker (nee Hawley) lives in Queniborough and was Mr Hollingworth’s secretary at Helvetia for three years in the 50s. “He was such a quiet man, you wouldn’t think he’d got that background – he was always calm, he never lost his temper,” says Beryl, now 82. In October 1972, Ralph was manager of SAIT, a Narborough industrial abrasives firm. He was going on a business trip to Ireland the day he had a stroke at home in Stoneygate. He never regained consciousness and died four days later at the Leicester Royal Infirmary. Ralph’s memorial service was held at the stunning St Clement Danes in Westminster. “He was a commander who disliked commanding as much as he believed in convincing by persuasion, Holly was from the bottom of his heart a gentle man,” said Per Federspiel, the wartime resistance leader, to mourners. “His approach to life in its various aspects – in good times and bad times – was inspired by a belief in the fundamental goodness and decency of man. I don’t think anyone can remember a single occasion on which he spoke evil of others. “It was not because evil things did not come his way and that he would shirk from condemning that which was damnable. But it was in his nature to show sorrow rather than anger. Ralph’s ashes were scattered in the garden of remembrance at Gilroes Cemetery in Leicester. Two years later, the Museum of Danish Resistance held a ceremony to unveil a bronze of Commander RC Hollingworth. Ralph’s wife, daughters, sister Mary and son-in-law Chris were there. This article was published in January 2011. Many thanks to Ralph’s daughters and to the Museum of Danish Resistance who worked very hard to get me the photos. 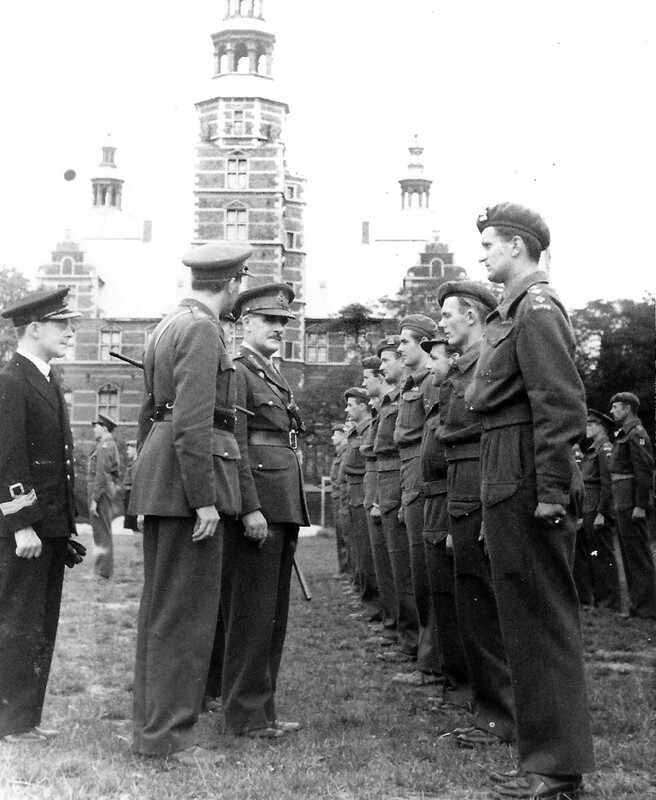 Ralph Hollingworth, head of the Danish section of the Special Operations Executive, looks on as the Danish military inspect the Buffs, now the Royal East Kent Regiment. 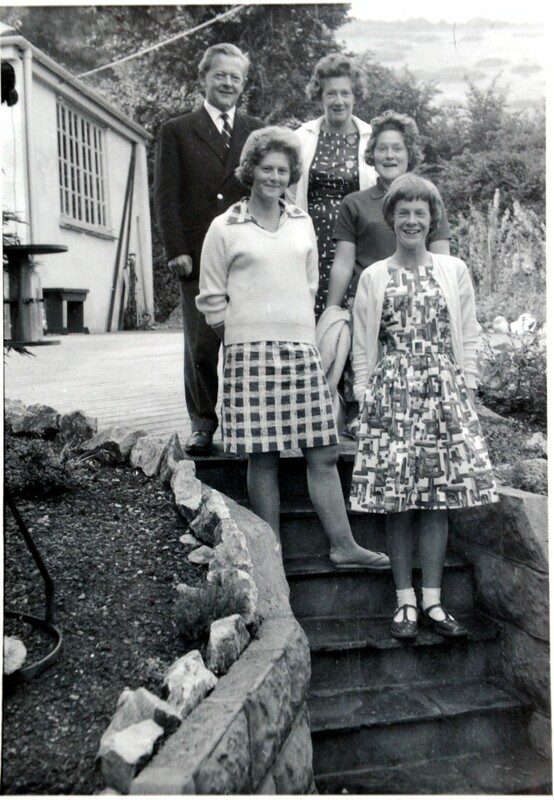 A post-war picture of Ralph and Fif Hollingworth with daughters Gill, left, Ann and, front, Judith.